This post is brought to you by . The content and opinions expressed below are that of Meihoukai in Wanderland. One brand wanted to know more — so they asked a bunch more people. 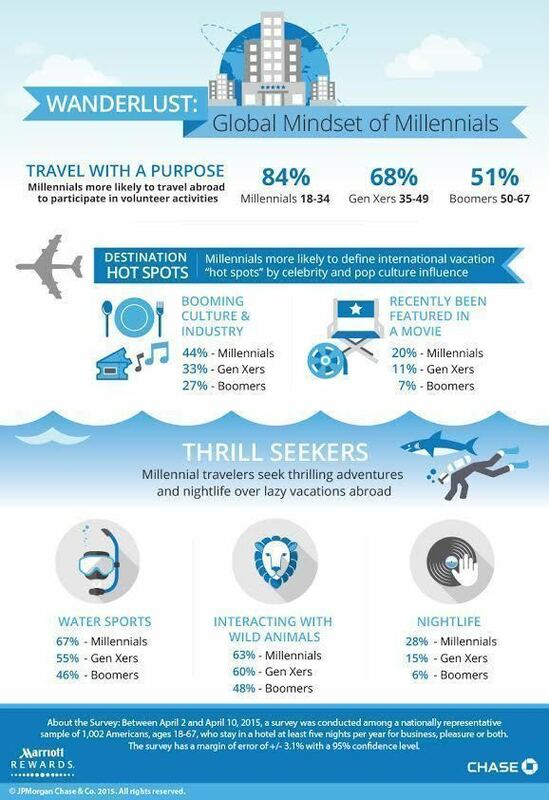 recently conducted a nationwide survey of travelers (defined by those who stay in a hotel at least five nights per year) aged 18-67 to see if they could once and for all suss out what us millennials (ages 18-34) are really into. You guys know I’m a travel hacking addict — and one of the keys to getting started is finding the best way to manage your money abroad with the perfect travel credit card for you. One example? The , which has no foreign transaction fees, and allows travelers to rack up accelerated Marriott Rewards points on all purchases. I have personally used cards like this to help me earn points that I redeem for nice hotels when I need a break from backpacking — it’s an awesome treat! Keep an eye out for sign-up bonuses that can help you nab your first free hotel stay more quickly. Visit for more info. She blogs over at , I keep telling her she has a niche and needs to exploit it…!